Eyes are fickle organs, which is why the HDR-9000 Digital Refractor has additional functions to eliminate any mishaps during the exam process. From the very beginning, cornea illumination and a vertex distance check ensure correct positioning, while a flawless convergence function guarantees the eyes will stay aligned during the near vision and presbyopia tests. The pupillary distance is also automatically calculated when changing modes to protect against inaccurate readings. The HDR-9000 Digital Refractor includes an easy-to-read LCD display that adjusts up to 90 degrees, so it is always at the ideal angle for clear viewing. The real-time display means instant information to guide you through the exam, while the data tables and graphs simplify the results process. The digital refraction equipment also offers a built-in printer to quickly put the data on paper. The eye exam process involves a lot more than just a digital refractor, which is why the HDR-9000 effortlessly links to the other equipment in your office, such as a lensmeter, projector, and mirror chart. Once all of the data is compiled, you will have a comprehensive report of your patient’s data that you can easily view at a glance. Since no ophthalmologist—or patient—is the same, the HDR-9000 Digital Refractor provides multiple testing options to satisfy any preference. Do you want to give your patients an eye-exam experience they won’t soon forget, while providing them with a lens prescription that makes their vision clearer than ever? 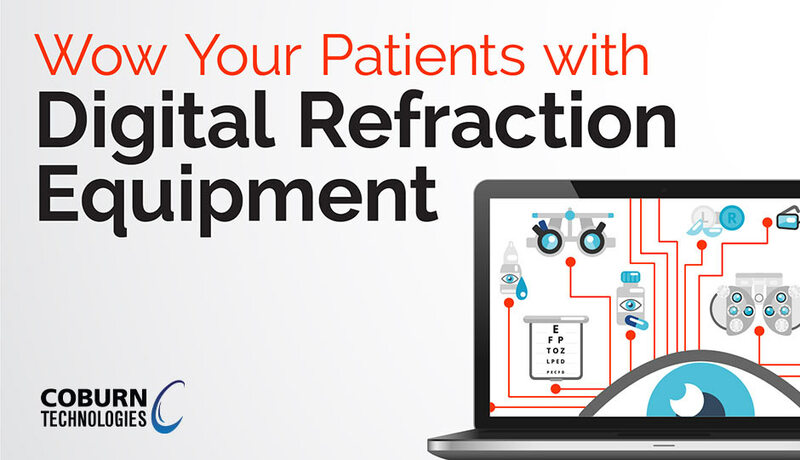 With digital refraction equipment from Coburn Technologies, the perfect vision test is now possible. Get yours today.